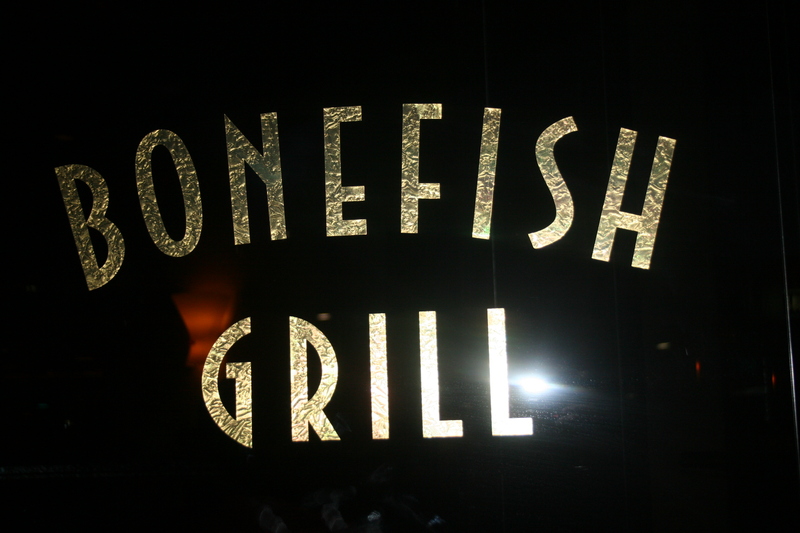 The good news is that yesterday was a warm and sunny 71 degrees, so that the fact that we had to wait 45 minutes outside of Bonefish Grill for our 7:30PM reservation, was not the ordeal it could have been. As each minute went by, I rehearsed in my head how I would phrase this debacle here on my blog. Jerry C. was offering suggestions for an opening line, “I have a bone to pick with Bonefish”, was among the more kinder possibilities. Things started out ok as after a short wait outside we were escorted to our booth in the VERY crowded restaurant. To say the booth was a bit tight is like saying we had a little snow this winter. Only six Joe B’s could have fit in that booth. The hostess saw the problem and told us that a table for 6 was opening up right next to our booth and if we went back outside we would be back in for that table within five minutes. The two people at the table for six already had their check. Ten minutes later one of our party went in to inquire as to what kind of watch they were using to determine our “5 minute” wait. She was informed that our table had been given to another group who had been promised it earlier by another hostess. We spent the next 30 minutes outside mentally drafting what would be my very first derogatory review. Our planning went awry when we were finally admitted and the Manager comped us two appetizers. It’s not that we were bought off with the “comp”, it’s just that when a restaurant acknowledges and gives evidence that they “care” that you were inconvenienced it’s hard to conger up that “totally pissed” frame of mind necessary for a bad review. So, Bonefish Grill in Deptford, NJ started off with a clean slate. Once we were seated we were able to fully appreciate the ambient lighting that, had any of us enjoyed a career as a coal miner, would have seemed vaguely familiar. It was so dark it was difficult to pinpoint where the noise, not unlike what you might find at a Dave Matthews concert at the Wachovia Center, was coming from. Fortunately, someone in our group had a miner’s hat, no wait, it was simply one of those little penlights which enabled us to make menu choices. While we studied the menu in the dim light we enjoyed the warm bread and excellent olive oil and pesto sauce. 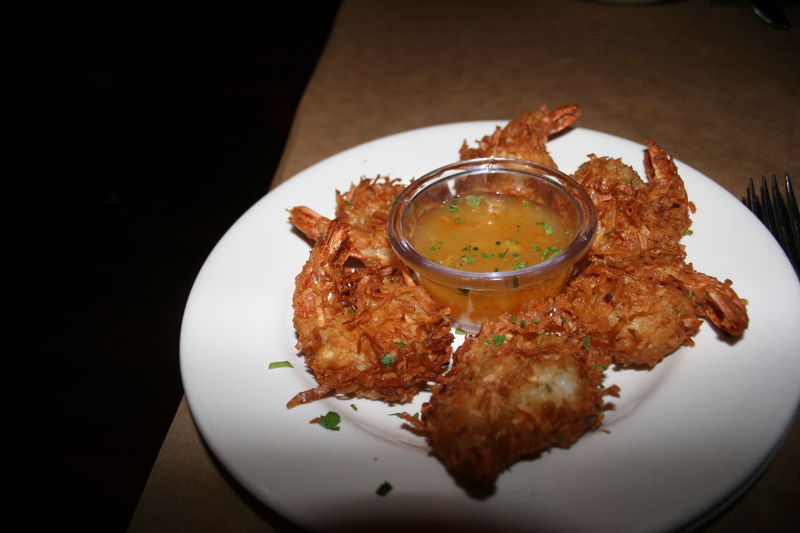 We ordered some appetizers, the Coconut Shrimp, Bang Bang Shrimp and Jerry and I had the Corn and Crab Chowder. 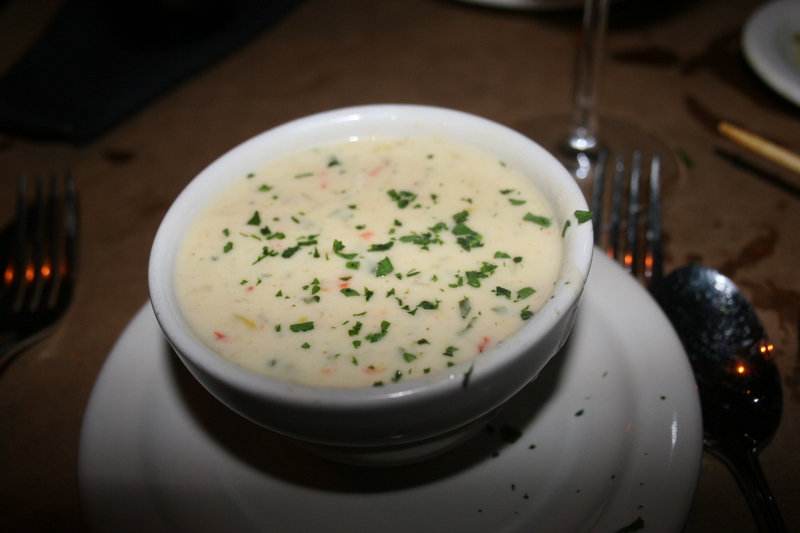 All of the appetizers were very good and we both found the chowder to be hot and flavorful with generous portions of crab meat. The wine, remember this is not a BYOB, was an inexpensive Malbec, the 2008 Montes Malbec ($26.00). 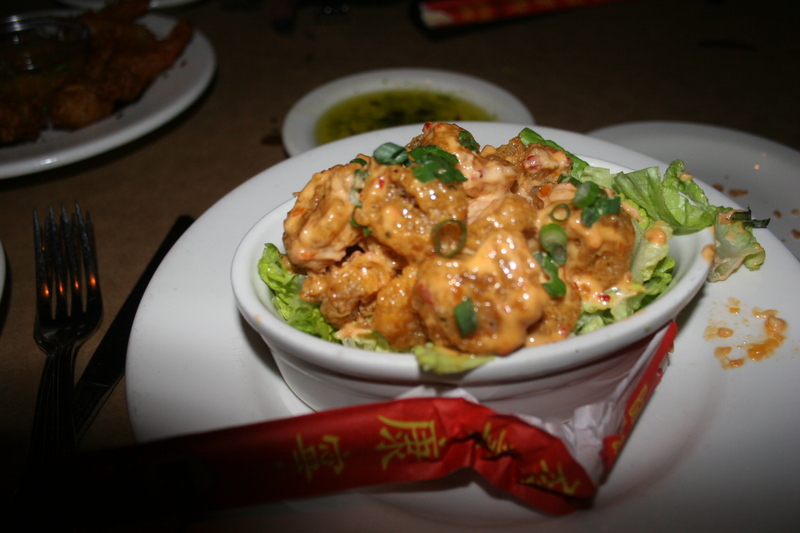 It wasn’t even worth a digital photo and aside from calming my taste buds after eating the Bang Bang Shrimp, added little to the meal. Being another meatless Friday in Lent, it helped that we were at a seafood restaurant with lots of inviting choices on the menu. 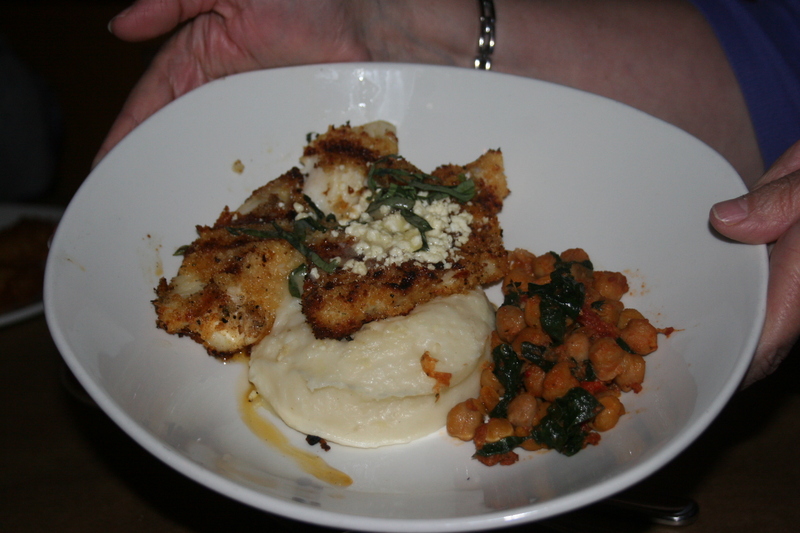 Casey, our server, rattled off the evening “specials” and Kathy and Sue opted for Kate’s North Atlantic Haddock with Feta and Artichokes, garlic crumb-dusted, wood grilled and topped with a lemon basil butter sauce. This item was served on a bed of garlic mashed potatoes and the veggie du jour which was garbanzo beans with spinach and sausage (hold the sausage, please). Both Kathy and Sue enjoyed their entree although there was some debate as to whether another side should come with it and Kathy found it difficult to taste any garlic in the potatoes. Jerry chose the Norwegian Salmon, again with the veggies and potatoes au gratin. He thought his salmon was good, he really liked the au gratin potatoes. I forgot to take a picture of my entree but in the dark it looked a lot like everyone elses. 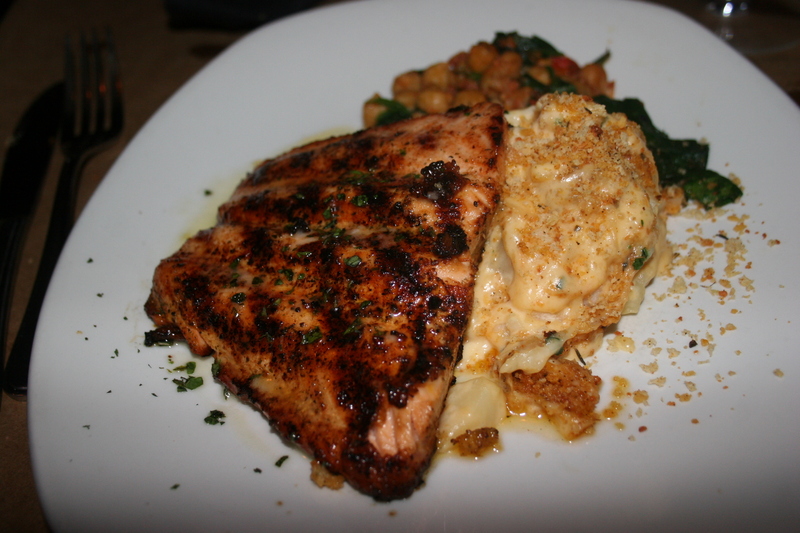 I had the Imperial Longfin (Tilapia) stuffed with shrimp, crab, scallops and lemon caper butter, along with the au gratin potatoes. I wasn’t crazy about the potatoes but the longfin was tasty and the filling generous and almost creamy in texture. Carol had the Coconut Shrimp that was offered as an appetizer as her entree and gave it a thumbs-up. 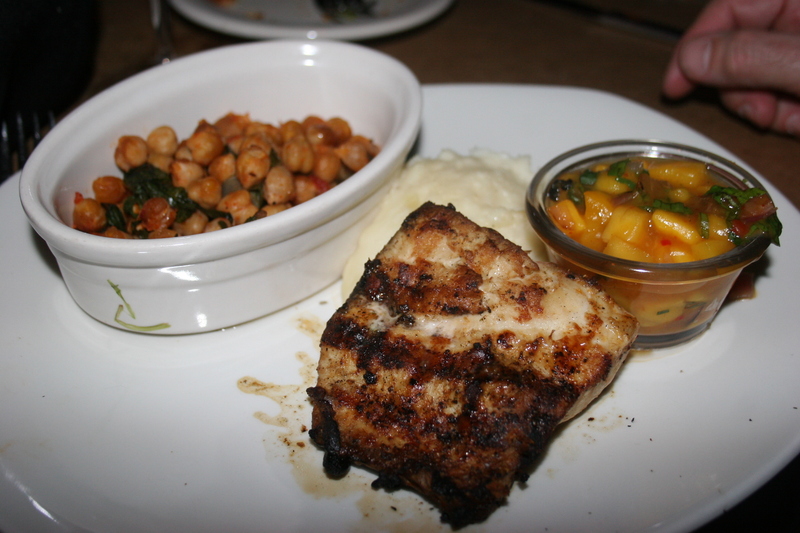 Joe had the Dorado (Mahi-Mahi) with a Warm Mango Salsa and found it enjoyable. Several of us thought that even though everything was very good there was a certain “mass production” feel to the meal. It would be hard to do otherwise when you serve as many fish entrees in an evening as Bonefish Grill does. I guess they deserve kudos for doing it as well as they do. We all passed on the desserts and overall, despite a fragile, teetering on the brink of disaster start, it was a good dining experience.